When you have a bit of net. COLUMBUS, Ohio — Muffet McGraw’s husband Matt clearly knows the drill by now. He beamed as he watched his wife of 40 years hold court with reporters after the greatest coaching win of her career. She wore a black dress that she’d bought especially for what turned out to be her second national championship, her signature short haircut still damp from the celebratory shower that her star center Jessica Shepard poured on her after her team won a most improbable national championship on Sunday night. Matt, for his part, wore a comically oversized green Notre Dame top hat with a gold buckle in front. If Matt didn’t know that Muffet McGraw was going to be constantly instructing, supporting, building, and scheming on behalf of her players when they first met, he learned it on the day they got married 40 Octobers ago. McGraw wore sneakers under her gown on her wedding day, a day that she called one of the four greatest of her life, along with the birth of son Murphy and yes, her second national title. Matt McGraw knows, after all these years, that the singular power of Muffet McGraw is a force to be marveled at. This is not mere spousal bias. Muffet McGraw’s second championship—a win that made her one of six coaches ever to win at least two titles in the women’s game, putting her up among names like Summitt and Auriemma—looked to be impossible by any reasonable estimation when the tournament began. One can find the makings of a championship lineup in just the astonishing four players McGraw’s team lost to ACL tears this season. That attrition was not just a question of quantity, although any team down four scholarship players would suffer a terrific handicap. But the players Notre Dame lost to injury were stars like Brianna Turner, McGraw’s all-American center, and Lili Thompson, her top point guard, twin anchors for what most expected to be next year’s run. The Irish were tough all year long and a deserving one-seed in their quarter of the bracket, but just given the players the team had lost, they were no one’s pick to win it all. Those diminished expectations allowed McGraw to do something she’s said she hasn’t managed to accomplish much amid all the accomplishments: really enjoy the ride. There is a lot that McGraw doesn’t say out loud, and emotions that she doesn’t display publicly. So much of what the Pottsville, Penn. native knows often remains unsaid behind pursed lips. McGraw doesn’t seem pleased with the fact that she can merely think the things Geno Auriemma gets to say out loud, but—again—it’s not something she talks about. It can be easy to mistake that reticence for coldness, but only if you ignore how McGraw interacts with and empowers her players. There, she holds nothing back. This unlikeliest of wins is proof positive of just how much McGraw gets out of the young women who come to play for her, and how much she helps them get out of themselves. This year’s team, as a group, became champions through a series of memorable plays, all of which required as much faith as skill. Arike Ogunbowale’s shot to beat Connecticut in the Final Four is already part of tournament lore; her shot in the championship game to beat Mississippi State will join it. Ogunbowale and her pair of game-winners deserve it, but those twin miracles shouldn’t overshadow the sense in which Notre Dame’s whole season was like that. McGraw has said that her team overcoming a 23-point deficit to beat Tennessee was the moment that made everything else possible, the proof she and her half-roster could do as much as they believed. All the smaller comebacks that followed, including overcoming double-digit deficits in both Final Four victories, made sense to McGraw and her team, even as they perplexed everyone else. 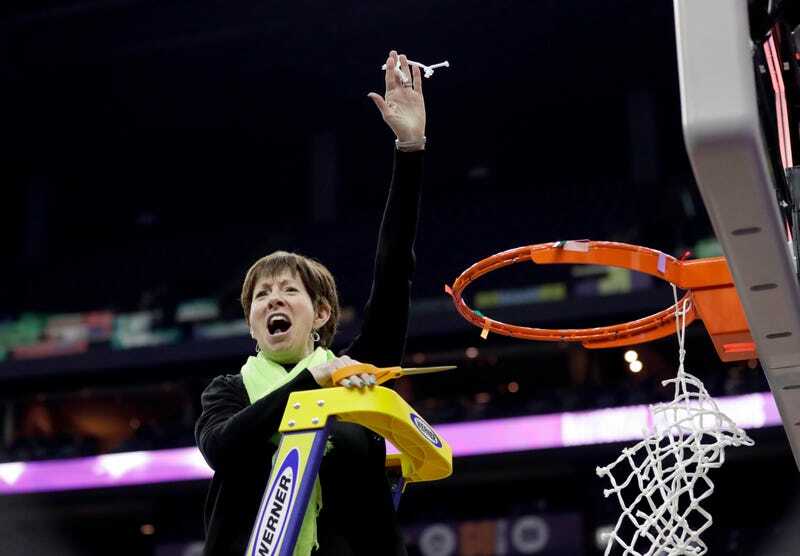 McGraw knew what she could do—she’d been Muffet McGraw for a long time, after all—but during the 17 years since Notre Dame won it all in 2001, all that sustained excellence, including five straight Final Fours from 2011 to 2015, hadn’t been enough to win a title. This is the thing that coaches tend to say after winning a national championship, but it’s not just something that McGraw says. She described 2018 as her most satisfying year in coaching, but to understand what that means, it helps to pay attention to all the former players who flocked to see her and Notre Dame at the Final Four in Columbus. They were there because she manages to be there for them, even long after their careers end. I still remember watching McGraw slip quietly into the crowd last summer at a New York Liberty game. It was done in typical McGraw fashion: There were no courtside seats or JumboTron cameo or any kind of fuss. She was just making sure she was present at her former point guard Lindsay Allen’s pro debut. The joy on her face when Allen scored her first professional basket—McGraw leapt out of her seat to cheer it—matched the smile when she headed to the podium on Monday night. 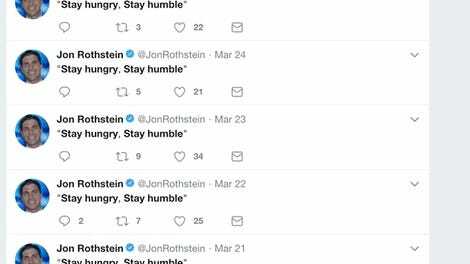 “It wasn’t my fault,” she said to the assembled reporters in apology for the delay. We all knew as much, because we’d watched her running back and forth in the back hallway to this television interview, that trophy presentation. Because she’s quiet, because she avoids self-promotion, and perhaps also because of those years of near-misses, there’s a tendency to take McGraw for granted, or at least see her as less of a towering figure in the sport that she is. There are newer flavors of story for us all, and deserving ones, the tangy Vic Schaefer quotes, the rise of Dawn Staley at South Carolina, the never-ending material provided by Geno Auriemma and his parade of WNBA lottery picks. It’s paradoxical—she’s been a part of the conversation for so long that she’s somehow no longer in it. And so it went even a moment of glory that was nearly two decades delayed—McGraw was happy to talk about everyone involved in the win except herself. She gushed about her twice-decorated hero Ogunbowale (“every coach’s dream”), and Shepard (“Where would we be without her?”), and Marina Mabrey (“she’s made big shots for us all year long”). The familiar McGraw reserve returned only when she was asked whether finally capturing that long-elusive second title, a few months after she earned a spot in the Basketball Hall of Fame, felt like validation. If they do that next year, McGraw will have to do a bunch more of these press conferences. Not one player who started for Notre Dame—or even checked into the team’s Final Four games—is graduating. The 2018-19 Fighting Irish will have everyone who got them to the mountaintop, plus that returning group of ACL tear survivors. Turner’s presence inside should be an invitation for the Irish to unleash the full Jessica Shepard Effect; Shepard, the team’s center-of-convenience this season, will be set free to fire away from beyond the three point line, benefit from Turner’s interior finishing, and finish her gloriously precise outlet passes. An excellent recruiting class is now a year older and more well-versed in McGraw’s Princeton offense. The defending champs are the likely preseason number one next season as well. McGraw knows some things will change. She acknowledged her conversations with recruits just got easier. And though the grind of finding the players who will keep Notre Dame among women’s basketball’s elite never stops, McGraw said that she’ll be taking some time this summer to go to Paris with Matt. At home, she’ll tend to her garden, albeit in the same way that’s made her a winner for so long.